Cross your fingers, Boston. I think I'm in a good writing position for the weekend. If all goes well, I'll have some kind of weekend post up late tonight. If you're looking for something educational, enjoy some animal and astronomical info at the Harvard Museum of Natural History this evening ($9 / $7 seniors & students). Michel Gondry is one of my favorite directors who imbues magic into his movies, and "Eternal Sunshine of the Spotless Mind" has been his most successful to date. "Brand Upon the Brain!" is a black-and-white silent film from Canadian director Guy Maddin who makes art-house cinema in quirky, intelligent ways that used to be seen more frequently before "Pulp Fiction". Last year, there was a whole lotta rock which was pretty cool. Looks like the organizers might have less amplifiers to worry about this time around. The Giving Tree seems like they put on a good indie-folk performance with many acoustic players in the group. In general, this is a generally pleasant mix of world, soul, hip-hop and folk. The ultimate shark movie where you don't see the shark until almost the end is showing today and tomorrow at: 3pm, 5:30pm, 8pm, 10:30pm. There was some talk about a free Narragansett for everyone over 21 at tonight's 8pm screening, but the theatre has publicly poo-pooed that notion. Maybe it'll be on the down-low anyway...? 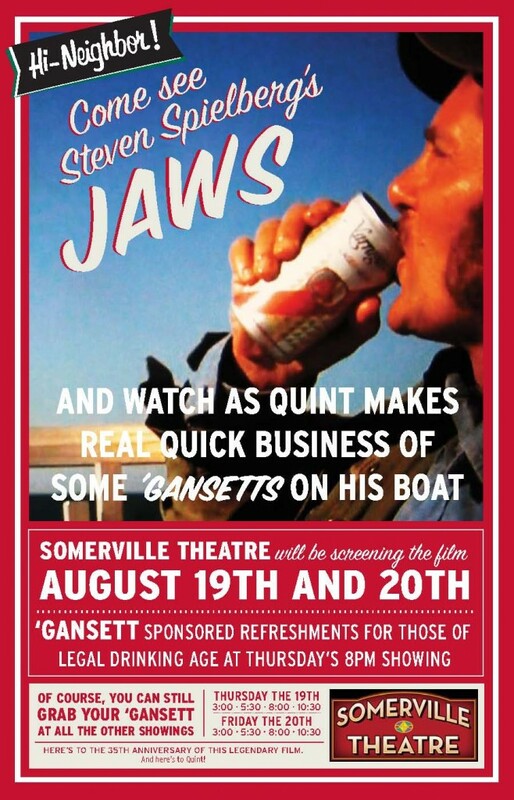 Maybe there will be very cheap 'Gansett...? When your tattoo shop has been open for 5 years, you might as well throw a punk/hard-rock party with bands, fashion show, art show, prizes, etc. That's what the Matalons are doing. Their big, bad rock is joined by a couple Boston punk bands and a mystery band inspired by a monkey rumor. This is part of the ThirdThursdays series from the folks that have brought us the NE Pop Festival in the past (and hopefully the future). The Vivs have rebooted their 90's indie-rock into solid songs of zingy, crunchy power-pop. For something a bit different, Goli is a not-quite rock, not-quite classical duo cello, marimba, and voices.